Put the 15w actinic Skinner into Warndon Wood LNR for six hours on Sunday in 13.5 degrees C and heavy overcast conditions. 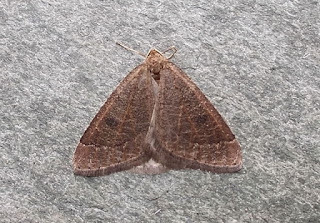 Small Brindled Beauty, 2 Pale Brindled Beauty, 2 Dotted Border, 5 Chestnuts and 4 Tortricodes alternella was the catch with 2 Early Moths torched on nearby blackthorn/bramble just after midnight. 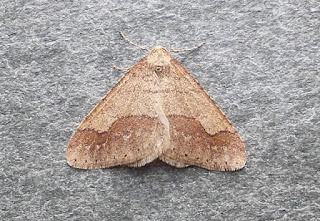 My lack of moths in the trap the other evening was compensated for slightly by a relative abundance of moths on the usual late evening dog walk last night, albeit they were all Dotted Border, but I counted 8 in the 15 minute walk along the lane. Well done for making the effort Steve, I hang my head in shame.